Fowl Cay is a private island with a difference: discover six uniquely beautiful villas spread across a private 50-acre retreat in the secluded chain of the Exumas, Bahamas. No neighboring hotels, no passing ships, no crowds – just you and the excitement of exploring a special kind of wilderness. Made up of 365 tiny islands and cays, stretching across more than 120 miles of crystal-clear, warm turquoise water – the natural beauty of the Exumas is one of the most extraordinary settings on the planet. It’s time to explore the world of Fowl Cay – no longer just a dream. Sitting at the center of the beautiful Exuma chain made up of little, scattered islands, deserted beaches and sandbars is Fowl Cay Resort. A vacation on Fowl Cay is truly like no other… and there are barely words to describe it–other than this is a getaway you need to experience for yourself. The best way to describe Fowl Cay Resort is that it is a casual vacation experience that combines the freedom of renting your very own island villa (or the entire island) with all the quality amenities of a full-service resort. Each villa comes with a fully equipped and stocked kitchen where you will wake up each morning on your own schedule and make your own breakfast. Then for lunch have our chef pack you a picnic lunch to take to a deserted beach in your own boat (also included with your villa). After you spend your day exploring the central Exumas, come back to Fowl Cay and shower in your luxurious villa and head up to the Hill House for cocktail hour and a gourmet meal with the other guests on the island and enjoy great food and conversation. It’s laid back luxury in the natural beauty of the islands that makes Fowl Cay so special and why a vacation with us will redefine your idea of relaxing and getting away from it all. Thunderball Grotto, located off the nearby island of Staniel Cay, is considered one of the best snorkeling spots in the Bahamas. At slack low tide, guests can swim into this underwater cave and view a variety of tropical fish, corals, and sponges. Scenes from the James Bond movie Thunderball and Ron Howard’s Splash were filmed here. Pristine aquamarine waters and white-sand beach surround this 50-acre private island retreat located in the middle of the Exuma island chain, about 322 km (200 mi) from Miami. The resort’s 6 freestanding villas feature balconies or patios with ocean views and full kitchens; amenities include satellite TVs, CD/DVD players, and wireless Internet access. Amenities include a freshwater pool, fitness club, and water sports. This All-Inclusive resort includes various amenities in the room price. See the room description section for details. Guests can take advantage of complimentary non-motorized water sports or simply relax at the beach or freshwater pool. A small fitness room is on-site and a walking trail winds through the island. Meals at this all-inclusive resort are served at the elegant Harbour Club Eating & Drinking House. Perched on the island’s highest point, the restaurant includes two limestone terraces with stunning ocean views. This 50-acre private island resort is located within the Exuma island chain, about 322 km (200 mi) from Miami. The resort provides complimentary boat transportation to the island from the Staniel Cay Airstrip, located just a few minutes away. On-site features include a freshwater pool, a tennis court, and a small fitness room with an elliptical trainer, treadmill, and free weights. Complimentary non-motorized water sports including sailing, kayaking, and snorkeling are available at the beach. The on-site restaurant serves gourmet island-inspired cuisine and creative cocktails. Room services is available 24 hours. The amenities listed below are available on site; fees may apply. Surrounded by pristine waters in countless shades of blue, this private island resort has a welcoming and casual ambiance. With just six villas, guests feel as though they have the entire island to themselves. Ideal for couples and groups of friends vacationing together, the villas provide all the comforts of home in a tranquil island setting. At Fowl Cay everything is included in the price of your Villa, and then some. From your fully stocked fridge and cupboards at your villa, to all the meals, premium alcoholic and soft drinks at the Hill House, in addition to your own personal motor boat with unlimited gas, you’ll have full access to the water sports, games equipment and amenities on the Cay too. Below is a list of what is included when you rent a house on Fowl Cay. You will be provided with your own golf cart to navigate on land. Feel Free to walk when you would like but let’s face it you are on vacation! Hop in your commuter cart for the week and zip around at your leisure. Our fresh water pool at the Hill House provides the perfect end to a day on the boat. Catch the last rays of the day after you rinse off in the pool. Head into the bar and mix up a drink behind the bar or grab a beer out of the fridge and enjoy your drink while sitting by the pool. The bar is always open and it’s always our round! If you want your own private pool, consider renting the Birdcage villa which has its own private splash pool on its patio. Fowl Cay has three of its own gorgeous beaches. The North Beach provides a peaceful location to sink your beach chair in the sand. The South Beach is the perfect spot to enjoy some of the on-island activities anything from a game of Bocce to a sail in one of our Zuma boats to paddling in one of our Kayaks for a workout or just spend all day lazing under the tiki huts enjoying the view. In addition to our beaches the Exumas are filled with deserted islands with nothing but white sand beaches to explore. And with your own boat you can choose a different one everyday to picnic on. Bring your tennis game but leave your big rackets at home. In the middle of the island it’s a perfect activity for when you need a break from the beach. When you are finished with your tennis game, head down to South Beach for a game of bocce ball on our waterside court. A great sport for all ages and skill levels. Whether you want to trawl in your boat through the many ocean cuts looking for grouper or whether you want to hire a guide* to go out into the deeper water for Tuna or Mahi-Mahi, we have plenty of rods, reels, line, weights, lures etc to help you catch your dinner which our chef can then cook up for however you like! This is last for a reason – if you must work then do not fear, you will have wireless internet at each house. But don’t let your colleagues in on the secret (just tell them you are incommunicado for the week – that usually works wonders for relaxing and recharging). Dotted around the Eastern perimeter of Fowl Cay are six gorgeous villas for you to use as your home away from home in the Exumas. Our one, two and three-bedroom villas all have fully equipped kitchens that are stocked with breakfast, lunch and snack items before your arrival (all included in the price). All have ocean views and are lined with French or sliding glass doors that open to beautiful patios overlooking the breathtaking water below. In addition to your fully stocked kitchen, also included with each villa is your own personal motor boat (gas too! ), a golf cart and use of all the equipment on the island. The boat allows you get out and explore the beautiful central Exumas while Fowl Cay provides the ultimate home base to return to at the end of the day. You make your own breakfast, our chef makes you a picnic lunch to take on your boat, your villa host packs a cooler and brings your fresh clean towels and you’re are off for a day on the water! When you return, jump in your luxurious shower and head up to the Hill House for cocktail hour and a gourmet dinner of local seafood and delicious desserts. It’s all there for you to enjoy and we are there to make it as relaxing and enjoyable as possible. Royal Plantation Island at Fowl Cay offers six freestanding villas decorated with warm Caribbean colors and mahogany furnishings. All villas feature spacious patios or balconies with ocean views, separate living areas, and full kitchens. Villas are equipped with satellite TVs, CD/DVD players, and wireless Internet access. Additional amenities include in-rooms safes, daily housekeeping, and complimentary bottled water and welcome amenities. 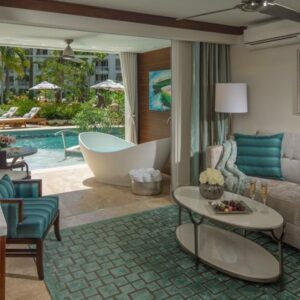 This all-inclusive Bahamas resort includes the following in the room rate: all meals and house beverages (including alcoholic drinks), butler service, personal golf cart, and the use of non-motorized water sports equipment. Small boats are available for guest use pending competency test and weather conditions. Moon-gazing with family or friends doesn’t get any better than from the terrace of this stunning and spacious three-bedroom en-suite villa. Located on the small ridge overlooking the eastern end of the North Beach, Blue Moon boasts striking views from your open-plan kitchen and living area. Designed for honeymooners or as a romantic retreat for two, Lindon is spacious and located idyllically on a low ridge above North Beach. Open-plan, bright, breezy and framed with large windows and glass doors, Lindon is a breath of fresh air. Star-gazing with family or friends doesn’t get any better than from the terrace of this stunning and spacious three-bedroom en-suite villa. Located on the small ridge overlooking the western end of the North Beach, Sweetwater boasts striking views from your open-plan kitchen and living area. Surrounded by flowering Bouganvilla, a covered and furnished veranda with a northerly breeze is a favorite dining spot for meal times and cocktails. You’ll feel as free as a bird in Birdcage Villa which boasts some of the island’s most magnificent panoramic and far-reaching views of neighboring cays and the beautiful Big Major Harbor. Spread your wings in this spacious two-bedroom abode – open plan, with an impressive kitchen, breakfast bar, comfortable living room with fireplace and dining area. This unusual tree-house style villa – octagonal in shape, with sliding glass doors and surrounded by wooden decking – offers a very original island retreat. Seabreeze is located on the south and highest point of the island just below Starlight and directly over the blue green water of the Exuma shallows. Elegant restaurant located at Fowl Cay’s highest point. Serves island-inspired dishes such as Grilled Scallops on Crispy Wontons and Island Rubbed Grilled Pork Loin. Includes two limestone terraces overlooking the ocean. Beachside restaurant serving grilled specialties. Features cabanas and fire pits. This Caribbean resort offers complimentary sailboats, kayaks, and snorkeling equipment. The resort also offers on-site bocce and horseshoe courts as well as a tennis court; tennis racquets and balls are provided. A walking trail extends from the tennis court to the west end of the island. Activities available for a surcharge include scuba diving, parasailing, and helicopter sightseeing tours. The recreational activities listed below are available either on site or near the hotel; fees may apply.